What’s better than cheesy, gooey pizza covered with your favorite meat toppings? Deep dish cheesy, gooey pizza covered with your favorite meat toppings! Unfortunately, the calorie, fat, starch and sodium cost make this beloved dish a treat that you should splurge on only occasionally. However, I’ve found a clever way to enjoy the flavors whenever you want—without the guilty aftermath. Dig in. Preheat oven to 350˚. Line a baking sheet with parchment paper. Heat a large skillet over a medium flame. Cook turkey with the Italian seasoning and crushed red pepper in the skillet for about 4 minutes, or until turkey is no longer pink. Drain off fat, then add the pizza sauce and cook for an additional minute. 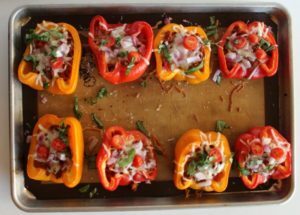 Place the bell peppers on the prepared baking sheet and fill each bell pepper with an equal amount of the meat-sauce mixture. Place the stuffed peppers in the oven and cook for 25 minutes. Remove peppers from oven and top each with 1 tablespoon sauce. Next, sprinkle mozzarella then Parmesan, tomatoes, and onions evenly over the tops of each pepper. Place pepper pizzas in oven for an additional 10 minutes or until the cheese is melty and bubbly. Garnish with seasonings and fresh basil. Allow to set 5 minutes before serving. Enjoy two pizza peppers. For more delicious dinners, try these simple recipes: Grilled Chicken Parm and Slow Cooker Chicken and Black Bean Chili!